The best airplane ride in San Diego. Seeing La Jolla and San Diego from a birds eye perspective is a once in a life time experience. Why Choose our Aerial Tour? 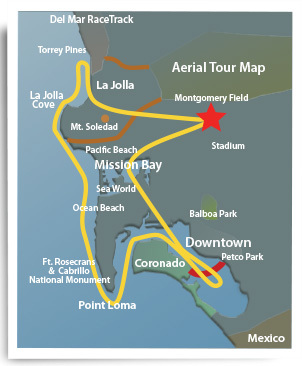 Our airplane ride is the #1 way to experience San Diego. Fly with us on your first day to get the 'right' perspective. Our pilots love these flights and are proud to show you the best of San Diego including the beaches, downtown, and San Diego Bay. Meet our experienced pilots! This Aerial Tour is more than an airplane ride. We offer an exciting way to create a memorable experience that will last a lifetime! Aerial Tours are taken aboard a 6 seat Cessna tour plane – a reliable all-metal, single-engine piston, high-wing monoplane. Every airplane ride is custom for you. Sunset excursions, Champagne Tours, Whale Watching, & 'You Fly' options available. Up to 5 persons, family, friends or a date. Every seat has a window! First Class service, easy and convenient airport access. All the best views on the beach and in town. You will be surprised were we can go! Learn all the secrets of San Diego in 30 min. Each pilot is passionate about telling you all they know. An education experience for youth. No age restrictions.